September 2, 1945...It was the day when World War Two, the most costly conflict in history, ended. It is uncertain how many people were killed during this war, many historians believe it to be over 60 million people. Other historians say it could be between 50 million to over 80 million people. The war started on the 1st of September in 1939. From that day, the war made its way to almost every corner of the world, much like how a bottle of ink spills over a piece of paper. 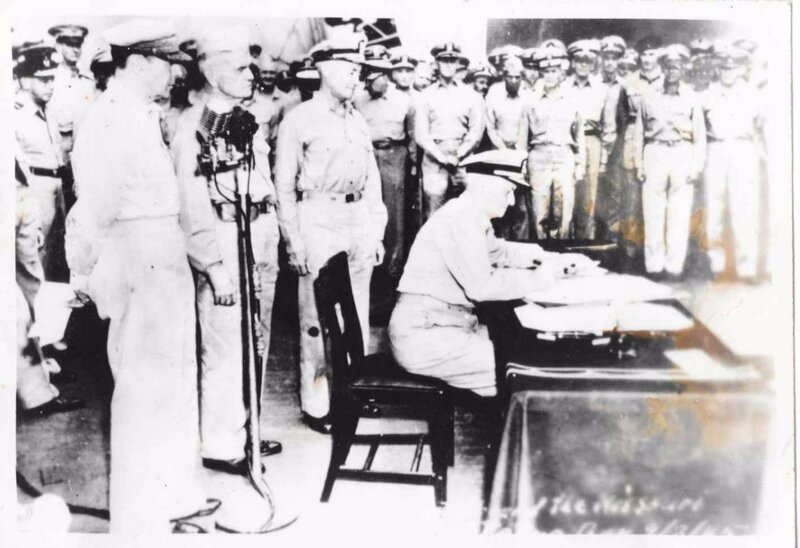 A lot happened between Sept 1, 1939 and September 2, 1945, imagine how it must&apos;ve felt when the news of Japan was signing it&apos;s surrender on the U.S.S. Missouri came. As joyous as the news was, it was also a bittersweet moment. The war was over, it was the time for reconstruction, technological innovation, the trying of war criminals and the start of another period of history known as the Cold War. Some of the true horrors of the war were just recently shown to the public, the genocides that took place in Europe and in Asia, the Atomic Bombings of Hiroshima and Nagasaki, and so many other events. We must never forget the men, women and children of all nations, races and creeds who lived, served and died during World War Two. A picture from my grandpa&apos;s photo album, although he wasn&apos;t there, I think it does show how much of an impact this moment was to the servicemen.